I wanted to put in some mileage this morning but I couldn't face another long run around the local roads. I'll probably be back on the street tomorrow but this morning I needed a break. I set out for Bethpage early under cloudy skies that felt like they could give way to rain. I decided that was fine because much of the bike path has decent tree cover. By the time I arrived, the skies had cleared but not to the point where the sun came out. I was happy for that. Running with sun is fine in winter but this time of year I prefer cool and dry with gray skies above. There were numerous walkers on the bike path at the start of my run. I made my way up the short steep hill that gives way to a long downhill section that almost catapults you through mile one. But it's a little like having desert before your meal. Easy as they are to manage at the start, those hills are a bear to address at the end. Soon enough, I was into the wooded part of the trail, trying to gauge my readiness to complete an eight mile circuit. 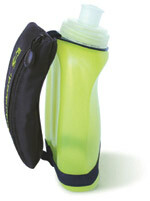 I brought along my Amphipod water bottle to see how things would go with some in-run hydration. 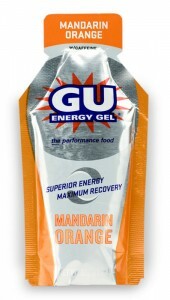 I'd also brought along a GU energy gel (Mandarin Orange flavor) that I plan to have for next week's race. My last experience with a gel pack (Honey Stinger chocolate flavor) did not go well but I still like the idea of having restoring carbs during the second half a longer run. I still don't love the Amphipod bottle because it's very cold to hold at the beginning (filled with ice) and it sloshes as the water supply depletes. Still, having water made a difference and it made my gel experience much better than last time. I ate the gel at the 4 mile mark and it helped me enough to maintain my first half pace over the last four miles. I took a few side trails that run parallel to the paved path. My turnaround point at four miles went around a small pond that was also ringed by a dirt trail. There were numerous runners along the way wearing team shirts and on my return leg I noticed mile markers along the bike path. It wasn't until I was near the Bethpage Parkway circle that I realized the Ocean to Sound Relay routed through this course. I really wanted to participate in that race but I couldn't get a team together. That's probably for the best because I'd prefer to focus on the Great Cow Harbor 10K next Saturday. About a mile from my end point I was surprised and happy to see Dave coming from the other direction, one mile into his run of the day. Later this afternoon my daughter and I did a run around the middle school field. She really ran well and maintained a decent pace throughout our run. I think her training is making a difference. I'm hoping mine is too. Don't forget to check out Runner's Tech Review. We haven't done a formal review of gels but that seems to be a good idea. I'll try the Nuun! The Amphipod I have holds 17 oz. It wraps to your hand with a little wallet in the strap. I'm going to look for a more insulated solution because the bottle was very cold at the start. I only used half my water on today's run so an 8 oz bottle may be enough. I like the vanilla with caffeine in it, tastes great for GU, gel but I bought a schwack of them, so I am due for another flavor. A question I am having for the longer run is, when is gel and sports drinks just redundant? Hmmm... I need the electrolytes so I don't get low, on Sodium. Heres my block for today!